Queensland Farr 40 Championship – Lang Walker’s chances to win the prestigious Aberdeen Asset Management sponsored event was placed in damage control when the provisional joint leader Kokomo was disqualified from her second place in race one. The disqualification handed down after a lengthy hearing found that the Kokomo crew who were engaged in a tacking duel with Sydney rival Estate Master had failed to allow sufficient sea room when both equally paced sloops executed the final gybe within the final 50 metres of the race. Kokomo was the windward yacht when both crews were committed to change tack, unfortunately Estate Master which had sailed below the lay line to the finish was effectively found to have been cramped for room. They were then ‘smacked’ with a stronger gust which forced Estate Master to almost roundup when their spinnaker blanketed out the daylight on the race committee vessel when it snagged on deck fittings bringing the sloop to a dramatic and unexpected stop. 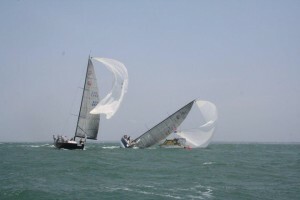 When they finally broke clear both the main sail and spinnaker were in tatters leaving the owner skippers Martin and Lisa Hill and their principal crew member 2000 Sydney Olympic Laser Bronze medallist Michael Blackburn with the opportunity to test their evidence on the incident in the Jury Room. The evidence found Kokomo to be at fault and was disqualified elevating Estate Master to second while the Guido Bongiorno-Nettis and his Transfusion crew remain as the progressive overall leader.